Catherine D. DeAngelis, editor. Oxford University Press, 2014. ISBN 978-0-19-992625-1. 219 PAGES, CLOTH, $45.00Reviewed by Susan M. Haack, MD, MA (Bioethics), MDiv, FACOG, recently retired from consultative gynecology at Hess Memorial Hospital and Mile Bluff Medical Center in Mauson, Wisconsin, USA. Robertson McQuilken and Paul Copan, Downers Grove, IL. InterVarsity Press Academic, 2014. ISBN 978-0-8308-2818-0. 667 PAGES. HARDCOVER, $45.00. Reviewed by Stephen N. Williams, MA, PhD, who serves in the Editorial Board of Ethics & Medicine and is a Professor at Systematic Theology at Union Theological College in Belfast, Northern Ireland, UK. Eric A Jensen, Ashgate: England and Vermont, 2014. Reviewed by Donna Yarri, PhD (Religious Studies), who is an Associate Professor of Theology at Alverina University in Reading, Pennsylvania, USA. 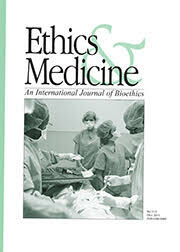 "For two decades, Ethics & Medicine has offered guidance to a perplexed world from the Judeo-Christian worldview and its Hippocratic medical vision."